This year’s holiday season is revealing interesting statistics and data on the popularity of ecommerce and mobile purchases. Custora, a company offering an analytics platform for ecommerce marketing, is currently gathering data from over 100 online retailers to provide a detailed report on this year’s holiday sales. 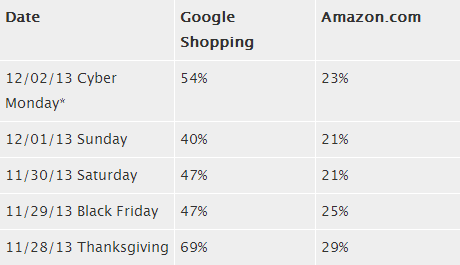 Based on this report (as of December 4, 2013), holiday ecommerce revenue is up by 20% from last year, with Black Friday sales going up by 16.2% and Cyber Monday sales increasing by 18.2%. Ecommerce visitor traffic has also increased by about 21% compared to 2012, with Cyber Monday traffic increasing by a significant 23%. Total holiday ecommerce orders are up by 20%. Orders placed via mobile devices (phones and tablets) have increased at the expense of orders placed through desktop computers. Mobile orders shot up to 28% from last year’s 20%, and desktop orders fell from 80% to 72%. Apple is still driving most of mobile purchases, but Android is starting to gain more traction. Orders placed using Android devices have gone up by 3% this year, while orders placed using Apple devices went down by 3%. Organic search, CPC (cost-per-click), and email continue to be the best channels for online marketing for ecommerce websites. Another interesting thing to note is that Google Shopping saw an increase in sales and outperformed Amazon in terms of same-seller sales, based on a report released by Mercent, a company offering a robust software platform for ecommerce businesses. Their eCommerce Performance Index compiles and measures sales growth data for over 550 retailers selling across different channels such as Amazon, eBay, and Google. Google Shopping launched new features last month, just in time for the holiday season. These features made it easier for consumers to browse, preview, and compare different items in their paid product listings. This move might have contributed to their success this year. With the popularity of online and mobile shopping growing each year, it’s important to reach out to your customers on different channels effectively. Working with a digital marketing and online advertising company can help your business gain more sales and loyal customers during peak shopping seasons.